The responsibility of maintaining balance can only fall to a select few—to the mystic shugenja tending to the spirits of the land; to the glorious warriors slow to conflict, but deadly when they act; to those who ensure the five elements remain ever in balance. 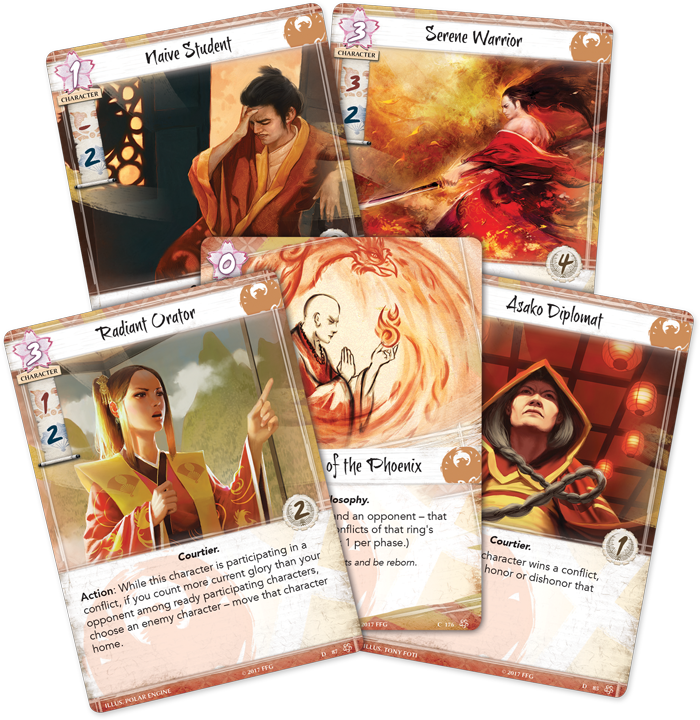 Today, we’re previewing the Phoenix Clan in Legend of the Five Rings: The Card Game. Tasked with maintaining spiritual balance and caretaking the emperor’s soul, few are foolhardy enough to test the Phoenix’s dedication to peace and harmony. 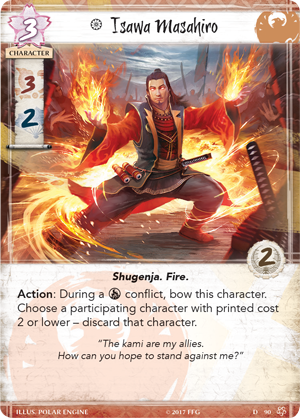 Powerful Shugenja of the Phoenix clan use the elements to their advantage when the need is dire. This is represented by abilities that can only be used during conflicts of a specific elemental ring, or if that ring is in your claimed pool. 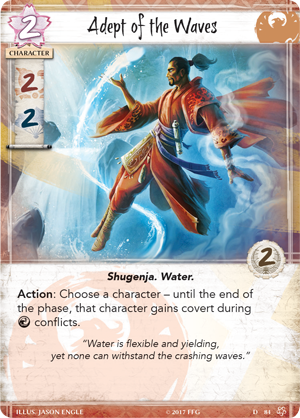 The Adept of the Waves (Core Set, 81) can choose a character to gain covert, but only during water conflicts. Isawa Atsuko (Core Set, 92) can boost the skill value of all your participating characters while decreasing the skill values of your opponent's characters, but only during a void conflict. 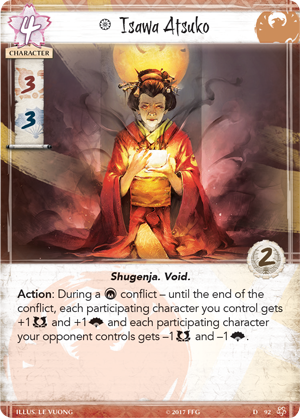 These two characters combined with the already revealed Isawa Masahiro (Core Set, 90) and Solemn Scholar (Core Set, 83), will form the backbone of the supportive Shugenja of the Phoenix Clan. None of these abilities specify a military or political conflict, and with a balance of skills, these characters are effective in either discipline. 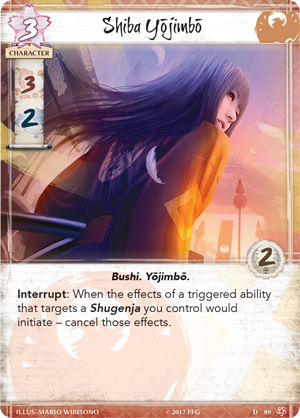 Of course, these Shugenja are high priority targets for your opponent, but can be protected by the Shiba Yojimbo (Core Set, 89). When the effects of a triggered ability that targets a Shugenja you control would initiate, cancel those effects. This can protect your Shugenja from effects that could lessen their impact, like Court Games (Core Set, 206), or remove them from the field entirely, like Assassination (Core Set, 203) . The Phoenix are dependent on their Shugenja, as having them on the field opens up new, and powerful, possibilities for the mystical clan. 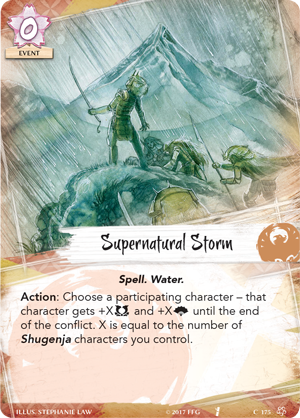 One of the most prolific of these is Supernatural Storm (Core Set, 175), an event that gives a character an additional military and political skill value for every Shugenja you control. This can provide the extra boost you need to break through a province, and at a cost of zero fate, is one of the most economical boosts in the game, provided you have a plethora of Shugenja on the field. The Fearsome Mystic (Core Set, 91) bridges two of the Phoenix Clan’s themes together. 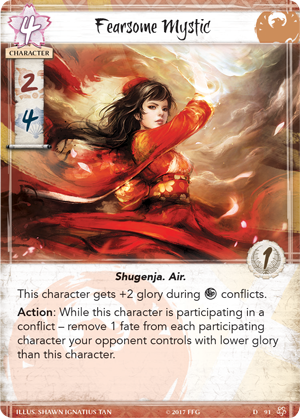 As a Shugenja, the Mystic gets plus two glory during an air conflict, and can remove one fate from every participating character your opponent controls with less glory than her. Not only is this a powerful ability for a shugenja to have, especially if the Fearsome Mystic is honored, it also plays into the Phoenix’s theme of glory. On their own, Phoenix characters are well balanced and can often hold their own in both political and military conflicts. However, when they become honored, they transform into major threats. 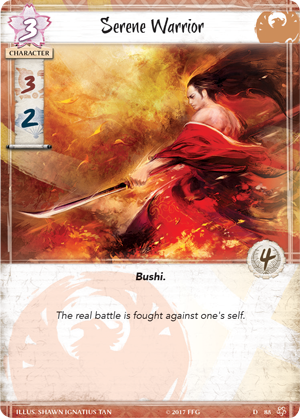 Perhaps the best example of this is the Serene Warrior (Core Set, 88), while three military and two political skill is impressive enough, the Bushi truly shines with four glory. Should he become honored, his military and political skills are boosted to seven and six, respectively. This puts him on the level of several clan champions for just three fate. However, with great reward comes great risk. Should he become dishonored, the Serene Warrior contributes zero military skill and zero political skill, making him effectively useless. 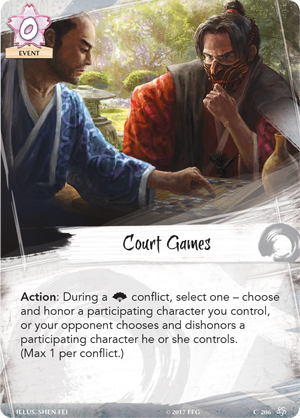 Luckily, characters like the Asako Diplomat (Core Set, 85) can be used to keep your characters honored. Every time the Asako Diplomat wins a conflict, you may honor or dishonor a character. 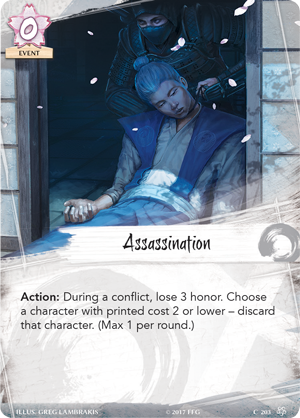 Not only does this allow you to keep your characters honored, but gives you the option and flexibility to dishonor an opponent’s character to drastically reduce their effectiveness. 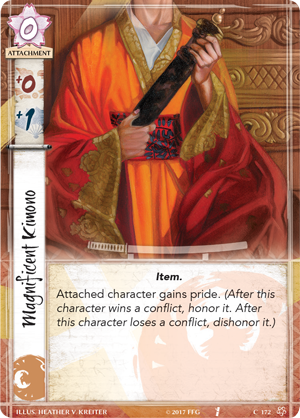 You can also honor your characters with a Magnificent Kimono (Core Set, 172), which not only boosts their political skill by one, but gives the attached character pride. Characters with pride become honored after winning a conflict and dishonored after losing a conflict. 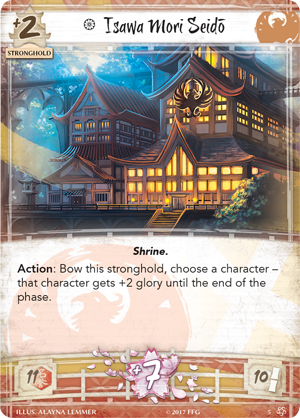 The Phoenix Clan stronghold of Isawa Mori Seidō (Core Set, 5) plays into the Phoenix’s high glory characters by boosting them even further; Isawa Mori Seidō can be bowed to give a character plus two glory until the end of the phase. This has the function of boosting the skills of your honored characters, but can also be used to raise the glory value of your opponent’s dishonored characters, further negating their own usefulness. The Phoenix province of Kuroi Mori (Core Set, 12) gives the Phoenix Clan complete control over any conflict taking place there. 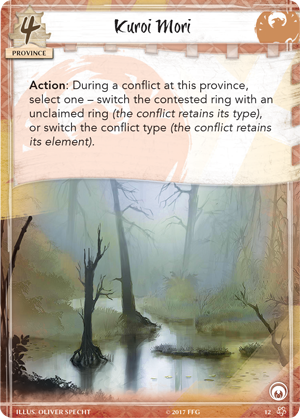 As an action, the defending player may change the contested ring of the conflict or switch the conflict type. 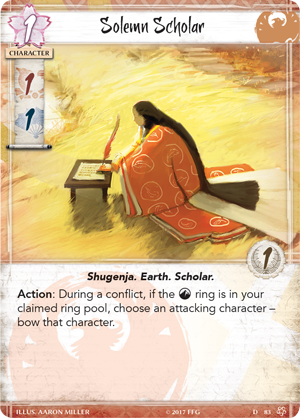 Switching the ring can activate the abilities of your Shugenjas, while even having the ability to switch the conflict type at will forces your opponent to attack the province with a balance of political and military skill, which may not always be possible. 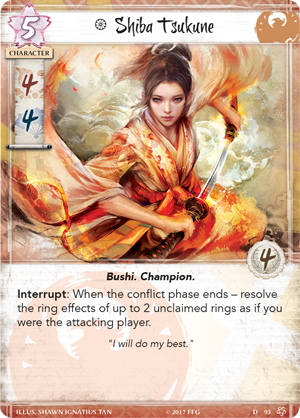 Though new to the role of Clan Champion, Shiba Tsukune (Core Set, 93) has already demonstrated the courage and dedication needed to lead the Phoenix Clan. 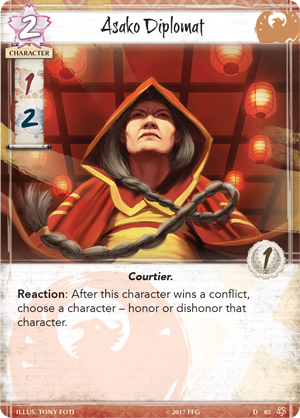 Her character card in Legend of the Five Rings: The Card Game brings the themes of the Phoenix together. With four military skill and four political skill, Tsukune is one of the most balanced champions in the game. With four glory, when Tsukune becomes honored, she becomes a huge threat with eight military and political skill. However, as an inexperienced champion, should Tsukune become dishonored, she becomes a non-entity in conflicts. Regardless of her honored status, Tsukune’s special ability gives Phoenix players a huge advantage. When the conflict phase ends, you may perform the ring effects of up to two unclaimed rings as if you were the attacking player. This can provide significant advantages without having to win a conflict. Phoenix are perfect for controlling what rings remain at the end of the conflict phase. 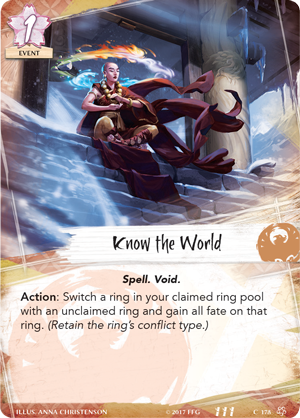 Know the World (Core Set, 178) can be used to switch one of your claimed rings with an unclaimed ring; when combined with Tsukune, this can be used near the end of the conflict phase to put a powerful ring back into the unclaimed pool for a second use. 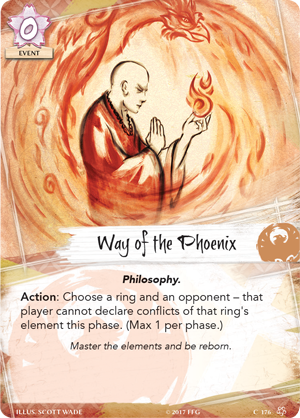 Furthermore, Way of the Phoenix (Core Set, 176) can be used to deny your opponent the ability to declare a conflict with a specific ring, leaving it for use with Tsukune at the end of a turn. With powerful tools available to the Phoenix, Tsukune is sure to make an impact in any game she appears. As keepers of the Emperor’s soul, the Phoenix have a sacred duty. With powerful spells and glorious characters, few can stand up the might of the Phoenix when they become involved in the conflicts of the Emerald Empire. 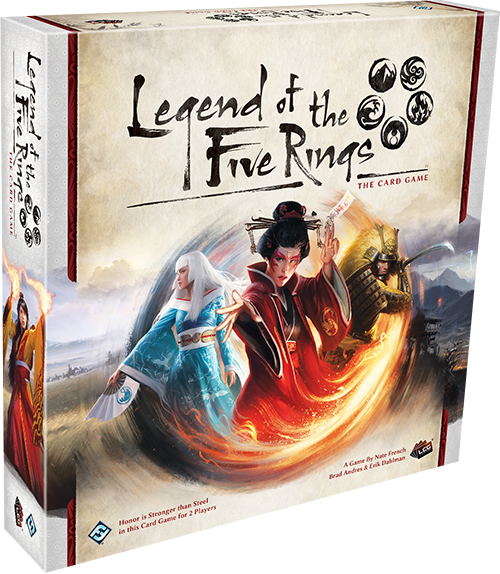 Protect the elements and purchase Legend of the Five Rings: The Card Game (L5C01) at Gen Con 2017 or when it releases in the fourth quarter of 2017.